AKSHA's Vision: A state that values the ability to effectively communicate through access to high quality speech-language and hearing services for all Alaskans. 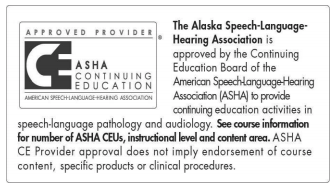 AKSHA's Mission: Empowering our members through innovative professional development, advocacy, leadership, and networking to pursue excellence in services for the benefit of individuals experiencing speech-language-hearing disorders and all Alaskans. AKSHA is operated by volunteers from the membership. More than 170 AKSHA members reside across the state. The AKSHA Executive Board (E-Board) consists of 4 officers, 2 ASHA Advisory Councilors and 8 Committee Chairs. Below is a list of the current E-Board and subcommittee members. Committees and subcommittees need and welcome new members. Contact Nominations/Awards/Scholarship Committee Chair at aksha907@gmail.com for more information!